We finished cleaning it off today. It's been a catch-all for 10 years. 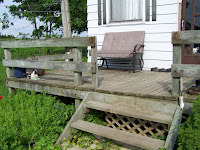 I always hated it, since anyone who comes to our house comes in the door at the back deck. Not exactly the first impression I like to give people. So, we've moved the garbage can and the recycling to the shed (where they belong! 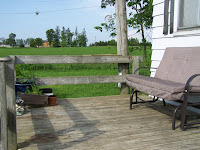 ), gotten rid of the various cow bones that the kids keep finding, put away the odds and sods, Jeff made me a little shelf for the laundry basket, we moved the flower containers into the corner, and put the glider there to enjoy the sunsets! I still have two flower containers that I want to put on either side of the glider, but I am thrilled with how it looks so far! NICE! Now you have to pressure-wash it and paint it or stain it. But it looks much better! I'll have to come when there's a sunset. I understand about wanting a nice entrance, first impressions do count eh? Looks great!